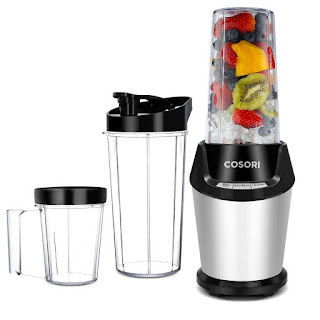 Today only, while supplies last, get this Cosori Personal Blender, 10-Piece with Cleaning Brush, Cups, and Bottles for ONLY $48.95 (Retail $69.99)! Simple, fast, &amp; powerful - 800-Watt (23,000RPM) blender with six SUS blending blades &amp; an auto blend program, making healthy drinks and smoothies &amp; offering you nutrients &amp; vitamins needed every day. Efficient Blending - Crush ice, seeds, and frozen ingredients at the touch of a button. Extract nutritious smoothies &amp; juices. Go beyond the classic smoothie and also blend up salsas, spices, even coffee grounds. Essentials included - Comes with (2) 32oz Containers, (1) 24 oz Container, (1) Storage Lid, (1) Travel Lid, (1) Cleaning Brush, (1) Recipe Book &amp; (1) User Manual. Auto &amp; Pulse Function - The easy-to-use 3-button interface (Start/Stop, Auto, &amp; Pulse) helps quickly use different applications and blends. UL ETL FCC FDA CE and ROHS Approved; 1-Year warranty.